TheArmenianKitchen.com : Bolsetsi Kufteh...or is it? In the Southern U.S., a recipe called "Porcupine Meatballs" combines ground beef with chopped onion, rice, seasonings. 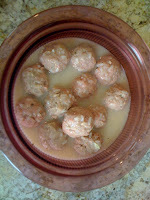 The mixture is formed into balls, then cooked in a tomato-based sauce. Why the name porcupine? The cooked rice sticks out of the meatballs, somewhat resembling the quills that protrude from a porcupine. Aside from the above tidbit, the recipe sounds suspiciously similar to an Armenian recipe my mother-in-law gave me. She called it Bolsetsi Kufteh -- in other words, kufteh (Armenian meatballs) as made in Bolis, the Armenian name for Istanbul. Neither of us can vouch for the origin of the recipe. Doug's Mom wasn't Bolsetsi, nor was anyone else in either of our families. But we can assure you that this is one hearty, satisfying dish that combines the tang of Armenian lemon-chicken soup with the tummy-filling goodness of meat and rice. Do any of you recognize this dish by another name? If so, please let us know! 1. Mix together the meat, egg, onion, rice, salt, pepper & dash of water. 2. Shape into about 12 - 15 meatballs. Coat in flour. 3. Bring 2 quarts of water to a boil; add bouillon cubes. 4. Carefully add meatballs to water. Reduce heat to medium and cook for about 25-30 minutes, or until rice is tender. Here's the part of our recipe that makes it different from the southern version. The southern recipe generally use a tomato-based sauce; the Armenian sauce uses egg yolks and lemon juice, no tomatoes. Prepare sauce just before serving. 1. In a small bowl, mix together the egg yolks and lemon juice. 2. Add a few tablespoons of the hot cooking broth to the egg-lemon mixture, stirring constantly. This procedure, called tempering, helps prevent the eggs from scrambling. 3. Slowly stir the tempered egg mixture into the broth - the color of the broth will change instantly. 4. Cook on low heat for about 5 minutes. Serve immediately in soup bowls with lots of crusty bread for dipping. My mom and I had a bonding moment last week when we made "yakhneli keuftah" together (in Armenian, dzhurot klolak). It is somewhat similar to your bolsetsi keuftah recipe, so I thought I would post it. 1 lb ground extra lean meat (for chi keuftah, or ground 3 times). For the full, traditional recipe, knead the lard or butter with salt, pepper, and allspice. Form into round balls (about 1/8 inch diameter). Place in the freezer to harden. For the lazy version, just omit this step. Run the bulghur briefly through cold water to moisten it. Knead all the ingredients (except for the lard/butter) for 5-10 minutes until it forms a dough. Shape into small balls about 1/2 to 3/4 inch in diameter. A small bowl of cold water will help in this step, because you can periodically moisten your hands to avoid having the meat stick to them. If you made the frozen butter/lard, then open up each ball, place the ball of butter/lard inside and close it over. As you make each keuftah, place it on a cookie sheet. Do not stack them so they don't flatten out. There are two versions of the broth. One is with yogurt, the other with tomato. My Aintabtsi grandmother made the version with yogurt, while my Adanatsi grandmother made the one with tomato sauce. One container drained yogurt (lebni) or one container of regular unflavored yogurt (in which case, reduce the broth to 3-4 cups). Boil the broth and gently drop in the meatballs. Bring back to a simmer and let the meatballs cook, being careful not to mix them too harshly (or else they will break up). When the meatballs float to the surface of the broth, they are ready. Place the yogurt in a mixing bowl and add a ladleful of the hot broth. Mix. Continue adding broth in order to elevate the temperature of the yogurt gently. When it is hot enough (lukewarm or a little more), you can put the yogurt into the pan with the meatballs and the remainder of the broth. This procedure ensures that the yogurt does not curdle. Gently heat the soup until the yogurt is hot enough to serve but at all costs avoid boiling (or it will curdle). Pour into the serving bowl, sprinkle with the dried mint (a generous amount). Heat the butter and, when it is foaming, pour over the mint. This will fry the mint. 1 medium yellow onion, sliced into crescents. Fry the onions in the olive oil or butter until they are translucent but not brown. Add the broth, the tomato sauce, the lemon juice and the mint. Bring to a boil and add the meatballs. Cook until the meatballs float to the top. Put into a serving bowl and serve. If you like, you can hold back some of the mint and add to the top as a garnish. Serve with crusty bread (Armenian bread is, of course, ideal). For the record, I like both versions. For a quick weekday dinner, you can use frozen tortellini instead of the meatballs. In that case, I reduce the amount of the broth so it is less like a soup and more like a sauce. That's what I call bonding! How wonderful that you are carrying on your family's culinary heritage. Way to go! Thanks for sharing the Cyprus version with parsley and mint... such wonderful flavors!